The Telugu New Year is close, and we are excited about the blockbuster movies that are about to be aired this weekend. The televisions are flooded with entertainment during Festival times. All the channels in an attempt to offer the best to their customers air the latest blockbuster movies, Special interviews, shows, and other engaging programs. More than anything the best movies are popular among the audiences and we are here to present you with the best options. Check them out. Another Rajini marvel that is an absolute wonder to watch, “2.0” is the much-anticipated sequel of Rajinikanth and Shankar’s “Enthiran”. The film stars Rajinikanth, Akshay Kumar, and Amy Jackson in the lead roles. The film was one of the highest budgeted Indian films ever and it also stood as the second highest grossing Indian film. “2.0” is going to be aired on Zee Tamil on April 7th at 06:00 PM IST. A surprising blockbuster from Kannada Film industry, KGF stars Yash, Srinidhi Shetty, Anant Nag, and Vasishta N Simha. The film was directed by Prashanth Neel. KGF narrates the story of a homeless boy’s journey for power and wealth that takes him to work in a gold field. Praised for its extraordinary narration, screenplay, performances, and visuals, the film stood out to be one of the highest grossing Kannada films ever. KGF was dubbed and released in Telugu, Tamil, Kannada and Hindi languages and the film became a blockbuster in all the languages. KGF (Tamil) is going to be aired on Colors Tamil this Sunday at 04:30 PM. A hilarious blockbuster that made both the Telugu states laugh uncontrollably recently is Venkatesh, Varun Tej, Tamannaah, and Mehreen Pirzada starrer “F-2”. Directed by Anil Ravipudi, the film narrates the story of two guys that deal with the frustration of life after marriage in their own way and land themselves in trouble. The film stood out to be a massive blockbuster released recently in Telugu. “F-2” is going to air on Star Maa TV this Sunday at 06:00 PM. Based on former Chief Minister Late Y S Rajasekhara Reddy’s padayatra, Yatra is a Telugu film that was directed by Mahi V Raghav. The film casts Mammootty, Suhasini Maniratnam, and Jagapathi Babu in the lead roles. Actor Mammootty dons the role of Dr. Y S Rajasekhara Reddy in the biographical film which was released in February 2019. Yatra is going to be aired on Star Maa on April 7th at 12:00 PM IST. 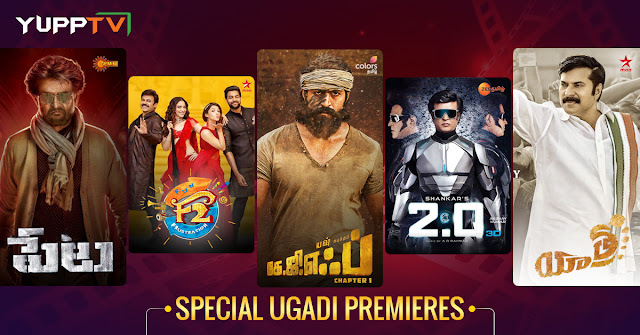 Alongside these, there are plenty of special Ugadi Programs on popular Telugu Channels ETV Telugu and Zee Telugu with all the popular comedy stars. Looks like we hardly have a minute to spare otherwise this weekend. Starring the Superstar Rajinikanth and directed by Karthik Subbaraj, Petta is a Tamil Blockbuster that had released worldwide in January 2019. The film casts Vijay Sethupathi, Simran, Trisha, Nawazuddin Siddiqui, etc., alongside Rajinikanth. Boasting of a great cast and an amazing story, Petta is one of the best Telugu films to have released recently. Petta is going to air on Gemini TV on 6th of April 2019 at 06:00 PM IST. Watch it online on YuppTV. Enjoy all Ugadi special programs on YuppTV from all over the world this weekend. Happy Entertainmentsy Ugadi Folks.